ASPCA's "Meet Your Match Dating Game And Gift Pack Giveaway! Oh, are we going to have fun this evening! The ASPCA is hosting a live stream event called "Meet Your Match" Dating Show to help spread the good word about the tons of gorgeous pets available for adoption-just in time for Valentine's Day! The event will be live from 6:00-7:00 pm EST and viewers will be able to meet some of the most eligible shelter pets available for adoption and even vote for the "Most Eligible" adoptable on the ASPCA's Facebook page. There will also be a "relationship expert" (really an ASPCA behaviorist) answering viewer questions about their pets. And don't miss the Twitter party happening at the same time as the live stream event-use hashtag #PuppyLove to join in the fun - the party will feature trivia questions about legendary animal-human couples and lots of prizes- and help beautiful orphaned animals find their forever home. See the end of this post on how to enter to win a very special ASPCA gift basket! So are you ready to meet your match? And now on to our giveaway! 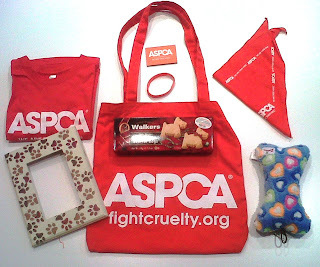 The ASPCA has generously donated a gift pack brimming with useful pet products both you and your best friend will love, like a plush heart bone toy, a paw print picture frame, ASPCA tote and other products, and Walkers Shortbread cookies! This giveaway runs from today,Tuesday February 12, 2013 through Saturday February 23, 2013 at 8:00 EST, so you and your friends will have plenty of time to enter. 2. Give this giveaway a shout-out on your Twitter or Facebook page by using the buttons below this post-easy! What a great idea. I hope that a lot of babies get adopted. We like you on FB, I shared this link, and I would like to win this to help promote the ASPCA!